Sometimes, it's just not fun to be the good guy. Sometimes, you need to be a little bad. Sometimes, you just need to destroy everything that lays in your path with a fiery ball of fury. 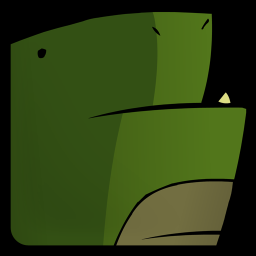 Burn The City puts you in the shoes of a giant lizard/Godzilla/monster-thing who has hatched all alone and in a strange world. Clearly, the logical conclusion he reaches is to destroy everything around him. This is accomplished by flinging fireballs from your mighty gullet, demolishing the buildings that face you. The buildings will be stripped down to their beams, finally collapsing under their own weight - and hopefully into the structures surrounding them. Fireballs will also bounce from their initial landing point and hit secondary targets, albeit with a smaller projectile. You goal is to demolish the city and gain points, moving on to more complicated scenarios. 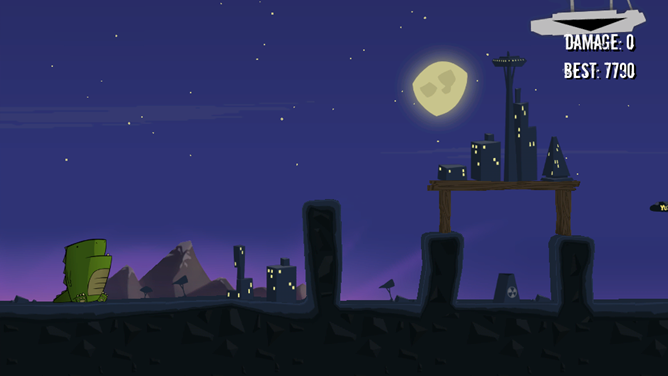 The game offers a number of levels with their own environmental hazards and terrain obstacles, like hills and solid stone. Ultimately, there's a lot of variety here: but does it play well? Burn the City plays an awful lot like Angry Birds in that you control of your monster's fireballs by spewing them in an arc. A crosshair gives an idea where the arc of the fire starts, but there's a bit of unpredictability, as it doesn't mark the top. It's kind of like only seeing the first third of the path it'll take: not enough to completely judge the shot, but enough to give you a good idea. 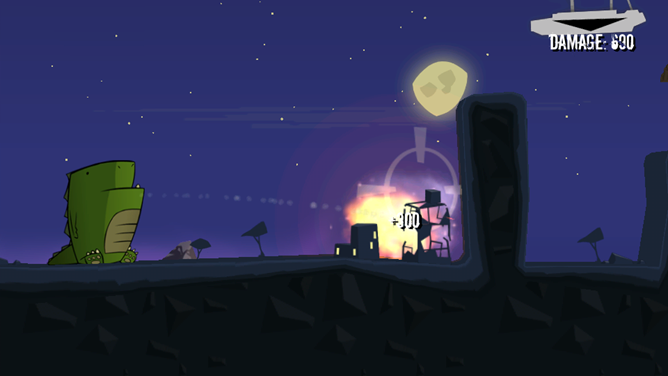 Like Angry Birds, the last shot's crosshair will remain on the screen for you in order to help you judge the next. Players are scored based on completion time, fireball damage and collateral damage, which occurs when buildings topple over on each other. The time element really threw me off, as again, the gameplay reminds me of Angry Birds. Instead of giving you a limited number of shots to complete the level, you're encouraged to fire as fast as you can in order to wreck the city. Sadly, though, you can't fire another shot until the first one has landed, and the camera is centered on your fireball; you can be at its mercy a little bit as you wait for it to pan back to your monster every time you decide to fire. I'm not really a fan of making your users' score depend on the clock, then putting impediments in their way to actually doing something quickly. If anything, make sure we can lock into a "zoomed all the way out" mode beforehand, instead of having to pinch-zoom out every level. However, as any good monster movie would tell you, it's not all about merely just breathing fire: it's about breathing atomic fire. 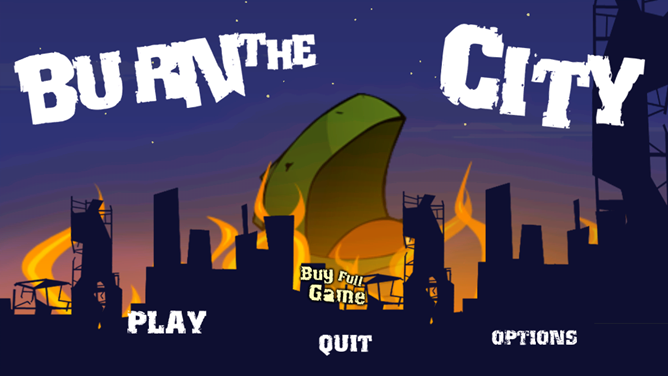 Burn The City has a number of power-ups that allow you to unleash special effects, and has strategically-placed explosives that have the potential to decrease the amount of work in front of you. One of my favourites is the green nuclear waste that allows you to obliterate otherwise-indestructible stone barriers: there's something really satisfying about seeing them demolished before your reptilian might. Powers can be saved for later use after collection, and are typically one-shot deals. I'm not a fan of how some are required to beat a level - there's nothing worse than wasting a power and having to restart. 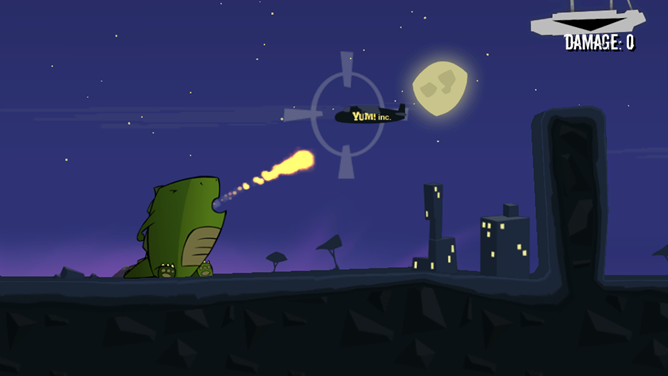 Burn The City's art style reminds me a lot of Dan Paladin's work for games like Alien Hominid and Castle Crashers; I really like the monster's design, and the simplistic nature of the graphics. The art style relies a lot on silhouettes, which I think is great: the building design is varied and clean, while the monster's a bit rougher along the edges. However, I can see the game getting really stale, really quickly; besides a scoring element that relies on different tiers of medals, there isn't really much reason for you to return to a level. I'm sensing a disturbing trend in mini-game apps in that map packs are really easy to add, so there's no real reason to provide more depth in gameplay. If the levels give you a boatload of experiences, why change the core? It's that core gameplay, though, that's going to get users to play those 500 levels you have. It's the ability to feel satisfied at your actions while being able to add some personal touch to it. Burn The City is on the right track with some mechanics (the fireball bouncing, in particular) but could really use a few features, like more power-ups or achievements, to make the game really shine. 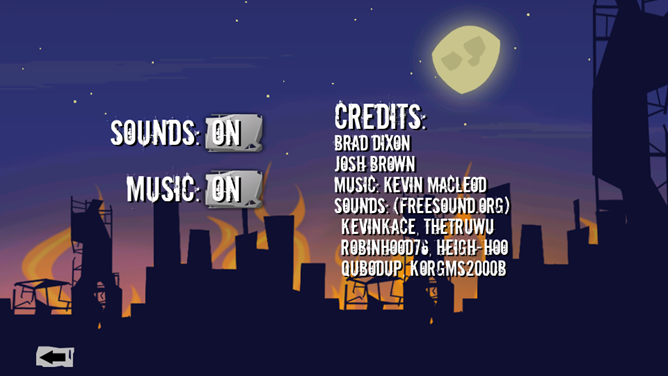 Burn The City has a free version that limits you to a certain number of levels, after that, you can spend $0.99 for the full version, which unlocks all the levels.